This is great opportunity to join the world’s leading brand with a store in Central Islip, New York. Please apply for Franchise Fee Range. It’s easier than you think to start your own franchise, but hurry and apply now! This store will franchise fast. Financing of up to 65% may be available through 7-Eleven® to qualified applicants. 7-Eleven is the world's #1 convenience store, and has been consistently ranked among the top-five franchisors. When you become a 7-Eleven Franchisee, you'll be partnering with a brand that's known and loved around the world. We're not only a leader in the convenience industry – we started the whole thing! And although we’ve grown like crazy over the years, our focus stays fixed on making life easier for customers. This idea may sound simple, but it’s the reason we’re the marketplace leader today. It’s also why both customers and investors are eager to be part of the 7-Eleven story. In addition to our resale stores, 7-Eleven offers single- and multi-store franchising opportunities, plus a variety of financial incentives and programs to help turn your vision into reality. Don't let your current budget stand in the way of a franchising career. You have options! We’re the Best for Vets! 7-Eleven offers special veterans incentives and programs because we know our U.S. military veterans have the skills and experience it takes to succeed as a Franchisee. Our program, our business model, even our training is structured, focused and extremely success-oriented. Military vets feel right at home with 7-Eleven. And in return, we couldn’t be prouder of our veteran Franchisees. 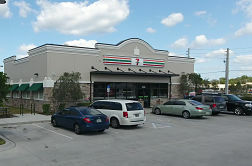 To find our more about this 7-Eleven location, Please fill out the form below and submit. Sign me up to receive the latest information from Franchise Resales.